It is the first time I got the chance to make clear line positioning with 515nm forest green line laser alignment. It is a quite special line measuring tool. Although its forest green laser beam is not as bright as 532nm green DPSS laser system, however, when this laser line generator is manufactured from 515nm green laser diode, the direct diode emission has just made this line aligning performance much more stable and reliable. The projecting forest green color laser beam is available with even higher laser beam stability. As a result, when this 515nm forest green line laser alignment is manufactured with full consideration of cooling system, it is just a quite realibel performance line measuring tool that is widely accepted for all kinds of industrial laser use fields and high tech work fields as well. For instance, this forest green laser line is also widely applied for laser line instruction for laser medical technology, military targeting, scientific research and lab experiment works etc. Although this shorter wavelength 515nm forest green line laser alignment is workable continuously, however, once it is getting higher range output power of 30mW to 50mW, it is just equipped with even higher operating voltage electric power source. High power 515nm green laser module takes even higher thermal consumption in constant laser line alignment operation. In order to get bright enough green reference line targeting performance, this laser line generator up 30mW is just equipped with higher operating voltage of 8.4V DC input power supply. It is a very important issue for users to keep highly stable line positioning during the operation of 515nm forest green line laser alignment. When green reference line is pointed on various working surfaces, owing to its noncontact green laser beam emission, the real line laser alignment operation should only be processed after its quite simple and proper installation on any industrial device. 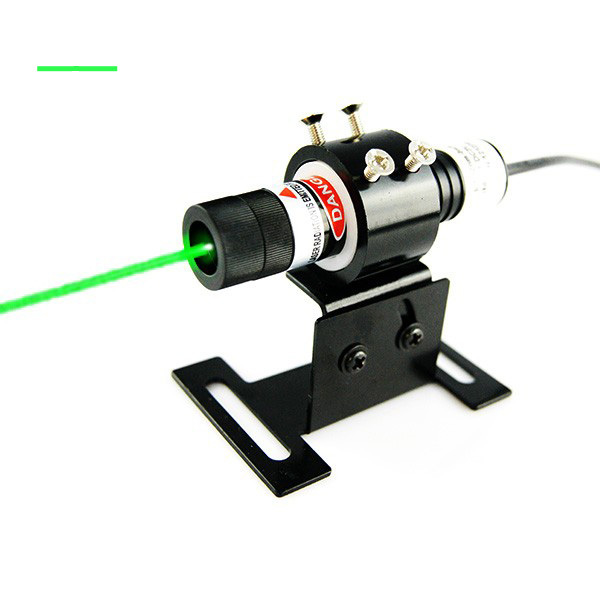 This 515nm green laser alignment is just being used as an accessory part of industrial device, allowing the highest straightness vertical or horizontal green line instruction on all raw material surfaces effectively. Owing to the special design of front glass window design in front of laser beam aperture, 515nm forest green line laser alignment is getting perfect laser line aligning performance from those of moisture occasions. The real line targeting is keeping high stability under all kinds of harsh occasions, such as rain, water, fog or others.